IN HER ninth attempt at a metropolitan win, Kraken Soupy finally delivered the goods on Thursday evening at Sandown Park. Kraken Soupy was fast to begin from box one asserting her authority early. It was then a case of catch me if you can as Kraken Soupy extended her margin down the back straight, before going on to win by three lengths in a smart 29.55. Trainer, part owner and breeder Kevin Eyles was “pleased as punch” with the run. “I thought her run was excellent, she hasn’t been jumping that good lately… luckily she came out well last night (Thursday) and picked the right night to do it – I’m pleased as punch,” said Eyles. The win shines plenty of attention on Kraken Soupy, something she thrives on back at home. It was the third time Kraken Soupy has visited Sandown Park within the month, after Eyles was uncertain if she was able to run out a strong 515 metres. “Early in her career I took her to Sandown but it was just a bit too far for her. The Kraken greyhounds have a large following, with all members of family owning their own Kraken hat. 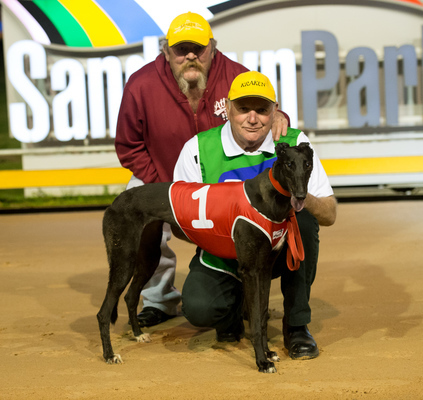 Hailing from Murchison, a small town on the Goulburn River, Eyles has been involved in greyhound racing for 15 years and it all started with the transaction of a car.